The old continent is dying. The euro is on the brink of collapse. This is what you can often hear in the press. But is that really the case? We invite you to read our today’s article about the development of the Eurozone in the last twenty years and find out what are the real prospect of the euro – and what does it imply for the gold market. In December, we celebrated 40 years of market reforms in China. In January, there was another important anniversary: 20 years of the euro area. So, let’s move from East Asia to Europe, analyzing the economic situation of the Eurozone and its implications for gold. After years of negotiations and preparations, the euro was launched on January 1st, 1999. Initially, the shared currency was only virtual, and the national currencies were still legal tenders used in circulation. For ordinary citizens little changed. However, the exchange rates between national currencies were locked at fixed rates against each other, while the European Central Bank took control over their monetary policy. The euro notes and coins entered the circulation three years later. The first members included Austria, Belgium, Finland, France, Germany, Ireland, Italy, Luxembourg, the Netherlands, Portugal and Spain. Greece joined the club in 2001, thought it should not have done, as it turned out later. Since then, seven more countries – Slovenia, Cyprus, Malta, Slovakia Estonia, Latvia, Lithuania – entered the Eurozone. At the beginning, everything was running smoothly. But then the financial crisis hit the Eurozone heavily, revealing significant defects in its architecture (the fatal flaw is that there is a currency union with the several independent fiscal policies). It was quite perverse, as the Great Recession erupted in America. However, the US – with its unified fiscal and political system – overcame the crisis relatively quickly. On the contrary, the Eurozone suffered a prolonged depression, as the financial crisis morphed into the sovereign debt crisis. Only when Mario Draghi famously pledged the ECB would do “whatever it takes” to preserve the euro, the market turmoil calmed. The truth is that the Europe’s monetary union is still unfinished, as there is neither a true banking union nor a capital market union. This is because the euro was the political project from the beginning, not an economic one. It was never an optimal currency area. But the idea was that the euro would push European countries toward deeper integration, making wars impossible. As economists, we are, thus, a bit skeptical of the prospects of the common currency and the whole bloc. Indeed, as the chart below shows, the Eurozone performed worse than the US. The former economy grew 31.4 percent by Q3 2018, compared to 50.5 percent for the latter. 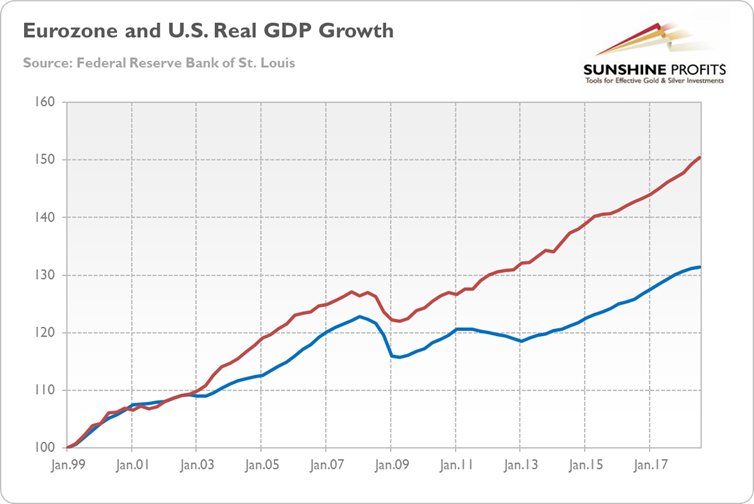 However, the pace of growth was also lower than in the US before the introduction of the euro. And the common currency did not prevent the whole bloc from growing (although the performance differed among the countries). Actually, the euro’s performance has been demonized. Its performance has not been as poor as one could expect, given the moderate growth in the GDP and all those gloomy headlines. Just look at the chart below, which presents the EUR/USD exchange rate since the creation of the euro. As one can see, the euro’s value against the US dollar was initially $1.1812. From then to the end of 2018, it dropped to $1.1456, or 3 percent. Not so bad, given that fact that it is used in several economically distinct countries. 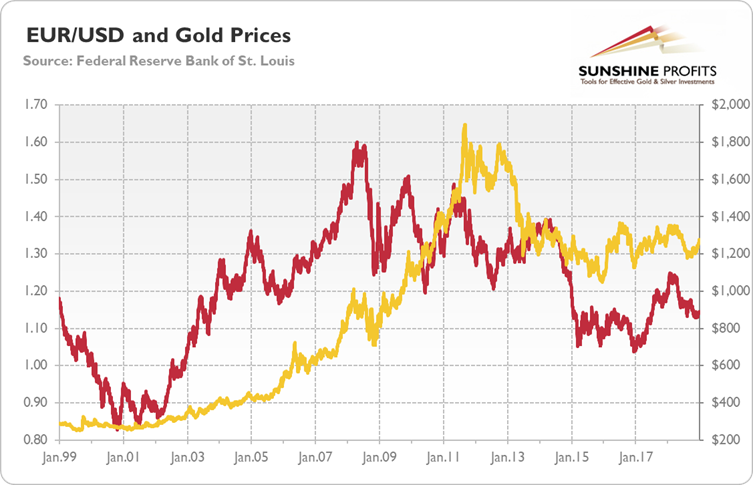 What are the implications for the gold market? Quite important, as it turns out. Please look at the chart above once again. Although the correlation is not perfect, it’s clear that the performance of euro, which is the second widely used reserve currency in the world, is significantly linked to the gold prices. It’s true that the Eurozone faces many problems, including still weak banking system or the rise in populism. But investors should acknowledge that the euro area is more robust today than it was at the start of the Greek sovereign-debt crisis (for example, the European policy makers established the rescue fund and launched the banking union). Moreover, despite the populist revolution, almost 75 percent of the Eurozone’s population support the euro. Even in Italy, almost 70 percent supports the common currency. And funny enough: when the risk premium increased, Italy’s new government also started to express more sympathy towards the euro. All this means that the euro is out of the danger zone, at least in the short run. Actually, the slowdown of the U.S. (and China’s) expansion could push investors towards the euro-denominated assets, especially when the ECB starts finally hiking its interest rates. If that happens and the euro strengthens against the US dollar in the second half of 2019, the price of gold may go up.